O Love is a wedding anthem whose lilting triple-time rhythm generates an unmistakably amorous atmosphere from beginning to end. The chromatically modal soprano melody assumes the heights of a soaring ondes martenot line that rises to its climax at the golden section. 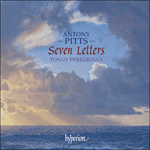 Pitts’s characteristic added-note harmony assumes an increasingly prominent role throughout, never more obviously than in the last verse with its voluptuous and conclusive final refrain.